contributions made by William Tyndale and Thomas Cranmer are especially important to the story of the English Reformation as they steered Protestantism through the turbulent years of Henry VIII, Edward VI , and Mary Tudor. religion and its moral values. he met such as Latimer, Cranmer and Bilney who were also intent on spreading the Gospel. John Foxe relates that Tyndale would “read privily to certain students and Fellows of Magdalen College some parcel of divinity, instructing them in the knowledge and truth of the Scriptures.” He graduated B.A. in 1512 and M.A. in 1515. In 1520 Tyndale accepted the post of chaplain to Sir John Walsh’s household at Little Sodbury where there were frequent visitors, including church dignitaries, which afforded the opportunity to learn of the recently published works of Erasmus and Luther. Erasmus had published his Greek and Latin New Testament which were to be relevant to Tyndale`s own work. Finally he had to leave the place and move on. But not before translating a book, the title of which might be put into English as “The Pocket-dagger of a Christian Soldier.” But then came his first brush with the prelates when he was arrested for ministering the Word. This was the turning point when he decided to undertake the same task for the English language. admonishment not to preach publicly any more. obtain a position. However, he preached at the church of St. Dunstan-in-the-West where a merchant, Humphrey Monmouth, heard him. 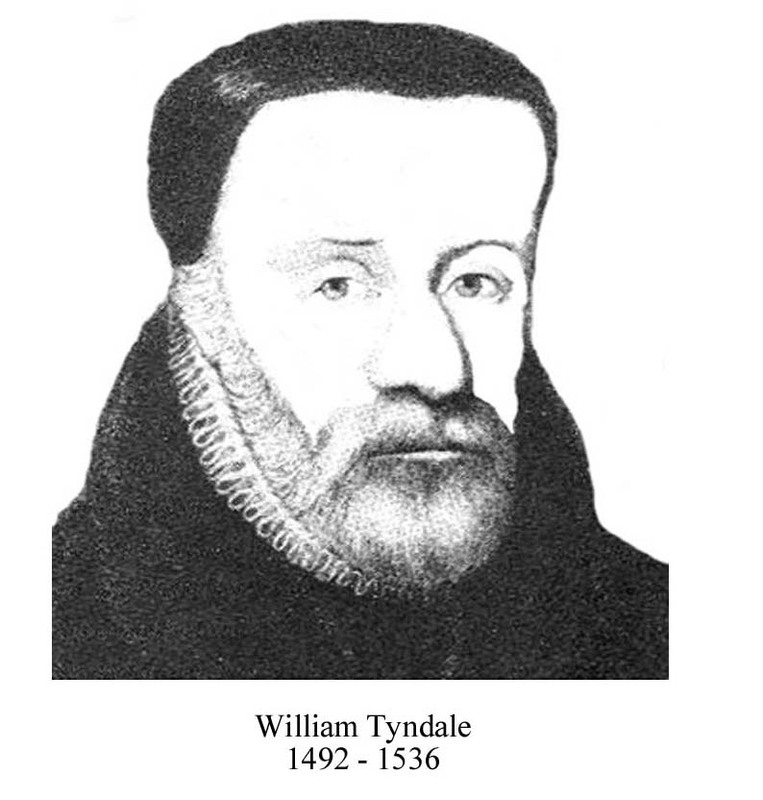 Tyndale`s preaching Monmouth took him home and supported him for over a year. Tyndale worked with John Frith, a mathematical scholar who was good at Greek. He joined Tyndale’s cause and helped to translate the New Testament. This they did for about six months before the clerics found them out and they were forced to leave. 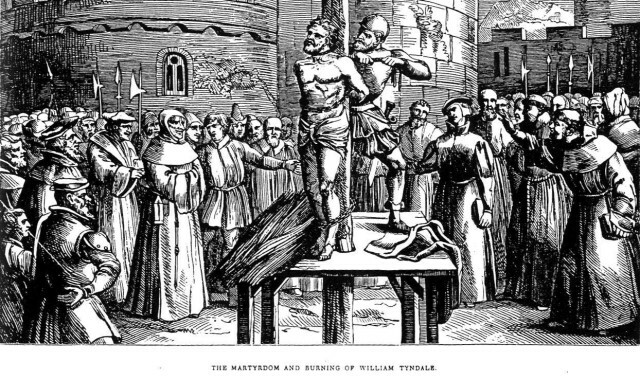 Tyndale left for Hamburg while his generous host, Monmouth was arrested and sent to the Tower of London. He managed to obtain his release by appealing to Cardinal Wolsey. Tyndale again moved on to Cologne where he continued his work and had his first type set for printing. However, loose talk led to John Cochleus, a Romanist nicknamed “the scourge of Luther,” latching on to him and Tyndale barely had time to gather his things together before hurriedly moving on. This time he went to the homeland of Martin Luther at Worms. It is probable the two men met and Tyndale would have enjoyed some measure of protection as a result. At his new home Tyndale continued his translation from the Greek to English probably using Erasmus’ third edition of the Greek New Testament, and Luther`s German version. by five Hanseatic merchants, hidden amongst their cargo of wheat, since neither Henry VIII nor the prelates desired the free circulation of the Bible. arrayed in all their splendour. concern was to maintain the privileges and uniformity of the hierarchy. out from office and subsequently dying in November 1530. It was while staying with a Thomas Poyntz, in 1534, that Tyndale was betrayed by one Henry Phillips, possibly a papal spy, but definitely a reward seeker, who delivered him into the hands of the authorities in Brussels, He was taken prisoner to the castle of Vilvorde, eighteen miles away from Antwerp. From May to October he remained in prison, where he endured both a terrible trial, and the dank and airless dungeons. Inevitably he was judged guilty of heresy and on October 6th, 1536, was taken from prison, tied to the stake and strangled. Then his lifeless body was burnt to ashes. His last prayer, was, “Lord, open the King of England’s eyes.” Within a year the English Bible received royal recognition, and a year later every parish church in England was supplied with its own copy. subsequent revisions of detail during the next seventy five years. when Mary Tudor came to the throne.